There is a casting process to documentaries, just as there is for fiction films. Directors look for interesting people to follow with their camera, or to interview. Good casting is often a key step on the path to creating a good documentary. In that sense, HEO Chul’s Ari Ari the Korean Cinema, which attempts to shed light on the history and current state of Korean cinema, features a kind of blockbuster casting. A broad section of the Korean film industry appears in the film, with dozens of veteran and contemporary directors including LEE Chang-dong, IM Kwon-taek, BONG Joon-ho, and PARK Chan-wook; actors like AHN Sung-ki, PARK Joong-hoon, SONG Kang-ho, and CHOI Min-shik; and also producers, critics, and other industry figures. Two people lead us on this tour of Korean cinema as interviewers and also commenters in their own right: veteran director CHUNG Ji-young (Unbowed, National Security) and actress YOON Jin-seo (Old boy, Secret Love). Director CHUNG originally began this project as its co-director, before the greenlighting of his film Unbowed obligated to him to turn the final editing over to his collaborator, the US-trained director and professor HEO Chul. CHUNG appears often on the screen, and it was his connections in the film industry that helped the documentary to assemble its impressive cast. YOON Jin-seo also took part extensively in the shooting and interviewing, offering a young generation perspective on the proceedings. 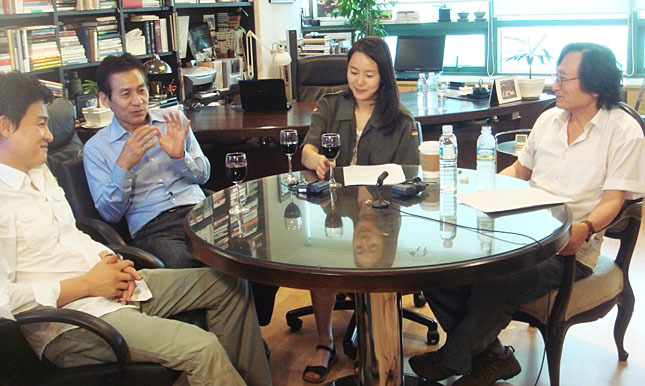 Director HEO Chul states that after recording interviews with close to 100 people, he had to confront the daunting task of organizing all this material into a feature-length work. He chose to divide the work into sections, with each section devoted to a different theme, for example the position of women in the film industry, or the increasing participation of conglomerates in the filmmaking process. Although not designed for people with no prior knowledge of Korean cinema, viewers with a basic understanding of Korean films will find a broad range of interesting perspectives and ideas to consider. Although looking deeply at several troubling issues confronting the film industry, the work also contains much humor, and its ending coincides with the encouraging revival of director CHUNG Ji-young’s career with Unbowed and National Security. Ari Ari the Korean Cinema originally screened at the Busan International Film Festival in 2011 before being reedited and significantly shortened into its current 83-minute form. It opened commercially in Korea on December 5, and it looks certain to take its place as an important document capturing the state of the Korean film industry at this important stage of its development.